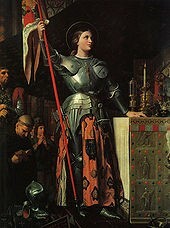 2012 saw the 600th anniversary of the birth of Joan of Arc (Jeanne d’Arc) also known as the Maid of Orleans! As a national heroine and a saint she is highly regarded by the French, principally for fighting the English to raise the siege of Orléans and to pave the way for the crowning of the French King. She was eventually captured by the English and put on trial for heresy and then burnt at the stake. What is surprising is that she was only 19 at the time of her trial. The City of Orléans (45 Loiret, Centre-Val-de-Loire) was the centre of celebrations and in every Spring there will be the Fêtes de Jeanne d’Arc which take place from 29 April – 8 May 2018. This will have all the usual elements of proper French festivals – processions, music, a medieval market, concerts and son-et-lumière! – all held beside the Loire. Best rates for hotels in Orleans such as Les Trois Maillets B&B, a 16th-century house, classified as a historical monument, just 30 metres from the Loire in Orléans city centre.